Some people think that makeup is bad for the skin, and that women who wear it are shallow or vain. Is this true? In some cases, perhaps, but not always. Unfortunately, no matter how great we may feel about ourselves, the truth is that society isn't kind to women who don't look their best. If you want people to respect and admire you, the way you look is an important part of the equation. This doesn't mean that you have to be perfect, but it does mean you should do as much as possible to put your best foot forward. It is the rare woman who is completely willing to buck societal pressure to be slimmer, more attractive, wear trendy clothes, and of course, follow current makeup trends. But, you can tailor a look that works for you, and makes a good impression too. Below we discuss the basics of how to apply makeup. It's important to follow these guidelines when it comes to applying foundations, powders, and blushes. When it comes to makeup, it's important to remember that less is more. If you lather on the foundation, you'll make yourself look like a birthday cake with too much frosting. Who wants to look like that? Add a bunch of powder, and you'll look like a frosted cake with powdered sugar! Not having much time to apply makeup, I like to use a good base like Dr. Feelgood Invisible Face Blotting Balm Foundation. I put this on after I moisturize my skin and it acts like a 'putty' filling in pores for a flawless look. It's loaded with vitamins and is good for your skin. I follow that up with That Gal - brightening face foundation primer. This brightens and tightens my skin. It has raspberry, chamomile, sweet almond, and algae extracts. It's like a 'mini' face lift. If it's been a long night, in addition to my regular concealer, Boi-ing - 02-medium - concealer,I use eye bright pink pencil - eye concealer to really brighten up my eyes. I use the eye bright pencil in the areas between my eyes and nose and pat in. I then use it right below my eyebrow on my brow bone and pat in. This stuff really brightens my eyes making me look awake and refreshed when I haven't had much rest. I can tell you that having sinus issues, allergies, and lack of sleep have given me dark circles under my eyes and these two products: Boi-ing and the eye bright pink pencil, have helped me combat the dreaded dark circles for years. To even out imperfections, I use get even pressed powder - 02 medium. This powder acts like a foundation and is a great quick cover to get you out the door looking good. Blush can perk up the way you look, especially if you're a bit tired and run down. Rosy cheeks will give you a fresh and alert appearance. Again, don't go overboard. Use a light shade of pink if you are fair skinned, or go for a peach tone if you have olive or dark skin. Make sure to blend well so that you don't have round patches of solid color on your face. You don't want your blush to look clownish. Prior to applying my powder, I like to use Benetint to give my cheeks a fresh stained rosy glow. This stuff also smells good too, like roses. Yes, good skincare is a must to great makeup application. 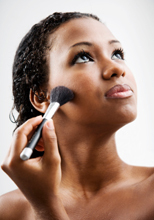 Aside from knowing how to apply makeup, a good skincare regimen is also an important part of your daily beauty routine. Avoid using loads of makeup, and make sure you wash your face every night to get rid of the day's makeup. This will let your pores breathe for healthier skin. Exfoliate, exfoliate, exfoliate! Makeup adheres and looks better on a fresh clean face rather than one that's full of 'flaky dead skin', oil, and dirt. Finally, avoid overexposure to the sun. Make sure to use products with good UV protection to protect skin from the sun's damaging effects. Choose products with a high SPF, especially if you are fair skinned. I especially like the Dermalogica line. They offer 'kits' like these below, which are a nice way to try the Dermalogica skin line without committing a lot of money. To rejuvenate my skin, I use Dermalogica Age Smart Power Rich. Yes, it is pricey in my book, and I was skeptical to say the least when my aesthetician recommended it, but I'm glad I tried it. This stuff truly works wonders to hydrate and 'plump' up my tired and stressed skin. I especially like using it when I'm really tired as my skin tends to sag a bit when I'm sleep deprived. I apply Power Rich about thirty minutes before I go to bed to give it time to sink in. I then use it in the morning too as a moisturizer after a long night of being up with sick kids. It's a great product that I highly recommend.